Имате въпрос към MG Suites Hotel Semarang? Идеален за развлечения и отдих, MG Suites Hotel Semarang се намира в Китайски квартал, който е един от районите на Семаранг. Разположен на 0.7 km от най-вълнуващите части на града, този 4-звезден хотел притежава отлично местоположение и осигурява лесен достъп до най-големите забележителности. Рай за почивка и релаксация - хотелът предлага пълна отмора само на няколко крачки от многобройните забележителности на града като например Semarang Town Square, Площад Тамрин, Град Парагон. MG Suites Hotel Semarang предлага безупречно обслужване и необходимите удобства, за да удовлетвори гостите си. Хотелът предлага достъп до широк спектър от услуги като безплатен WiFi достъп във всички стаи, 24-часова охрана, ежедневно почистване, 24-часова рецепция, съоръжения за инвалиди. Влизайки в една от 148 уютни стаи, ще забравите за ежедневния стрес с помощта на удобства и съоръжения като телевизор с плосък екран, телефон в банята, стойка за дрехи, безплатно разтворимо кафе, безплатен чай в някои от тях. Независимо от това, дали сте фен на фитнеса или просто търсите начин да отпочинете след уморителен работен ден, в хотела ще намерите най-висококачествените съоръжения, такива като тематичен парк, фитнес зала, сауна, открит басейн, спа. С перфектното си местоположение и несравними удобства, MG Suites Hotel Semarang е един чудесен избор в много отношения. love this place, its located at the heart of city. so close to poncol train station. Its connected to a shopping center (even though the shopping center is not really something, but still you can grab some food there). 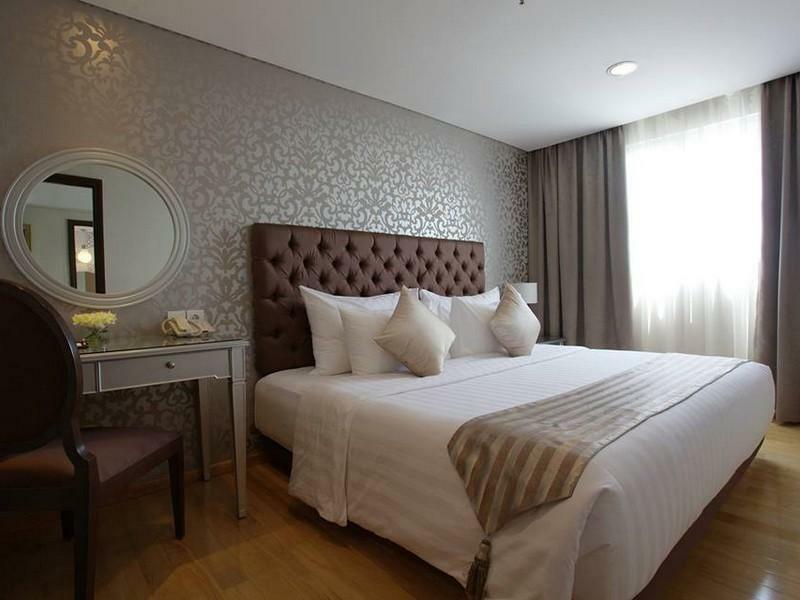 the room is clean and spacious and comfy, the staff were so friendly. They have 2 swimming pool and its really nice. food was ok. recommended spot to rest your head in Semarang. This hotel is very nice. Love the apartement concept. 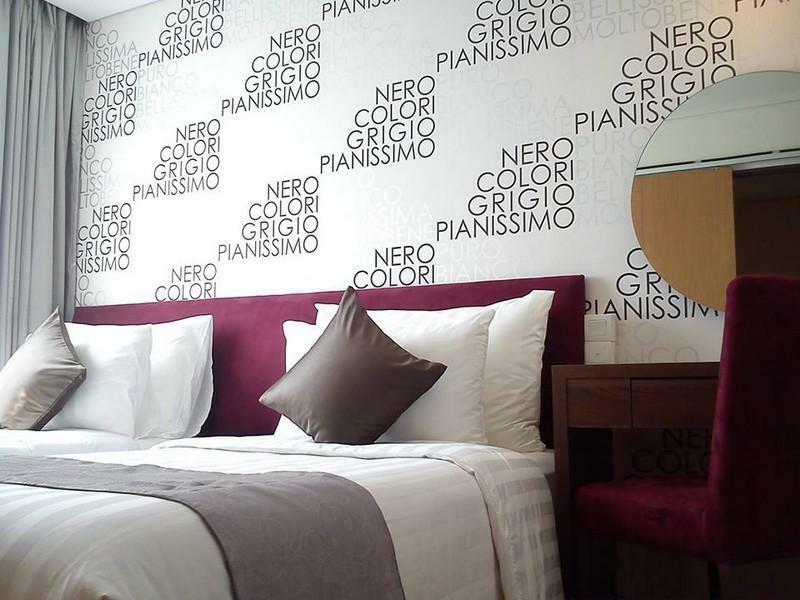 With cozy bedroom and comfort bed, nice shower, big refrigerator, and also the swimming pool. I definitely would recommend this hotel to anyone. Ah, one more minus thing I found: there is no ATM machine at all, even at the mall beside the hotel. Put some ATM machines then it will be perfect place to stay. Apparently we arrived as the receptionists were trying to figure out rooms for about 100 people there for a conference. It was nuts and I hope to never experienced it again. Then apparently agoda switched to booking.com since we booked and that was absolutely a mess trying to get rooms for us sorted and bring up confirmation numbers on our phone, which didn't matter in the end and we just had to book two nights on the spot. A nightmare especially with a one year old who had been flying for 2 days. The rooms were absolutely beautiful for the price however. we were surprised by the beauty of this apartment, that was hidden in a small side road, the access is really not so nice, but as soon as you are inside, you will forget this as the apartment is really really a perfect nest for a family with 2 children ( we stayed in a 2 bed room suite), Our suggestion : it would be nice to provide kitchen utensils, if one books an aprtment, he expects to get those things available. Variety choice of breakfast for asians. Love the food. Friendly staff. However the hotel wasnt strategically located. Need to go everywhere by taxi and there wasnt even convience stores nearby. Hotel in need of major upgrade. Overrall good stay. having honeymoon in here is the best . nice hotel, all hotel looks like home, having littl kitchen, living room, toilet, shower room, and bedroom. its awesome to stay long. nice people and serving, they have cafe down too.. so lovely to stay again. 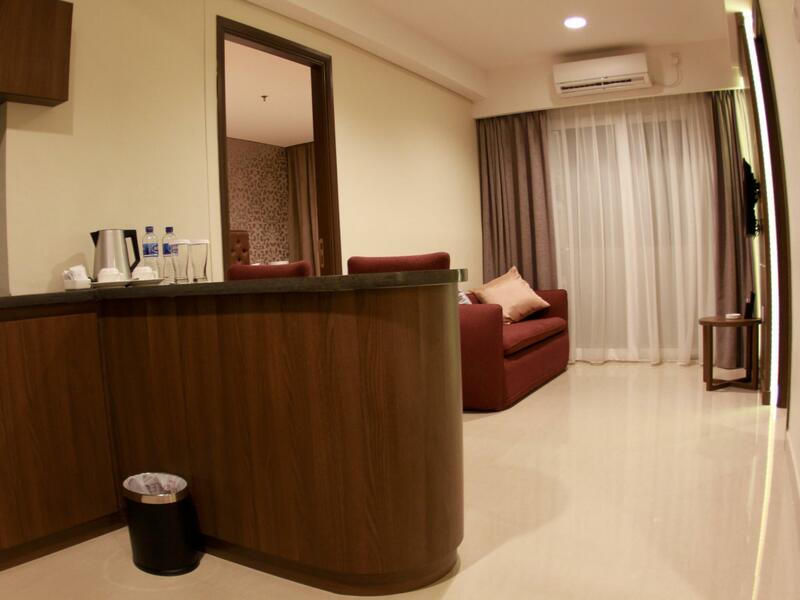 Spacious room for family travelers, complete with big refrigerator and small pantry. which is a point plus for us. However I found the bathmat was very dirty with stains. Park area and lobby access was not really easy for drop off. Overall I really enjoyed my stay at MG Suites, will come back again!! Quality laundry was not good, once my polo t-shirt & jacket came from laundry became bit damage due to ironing and for my jacket one of item was lost at zipper hanger. Please consider these things to guest hotel and improve service hotel itself being good. Regards. 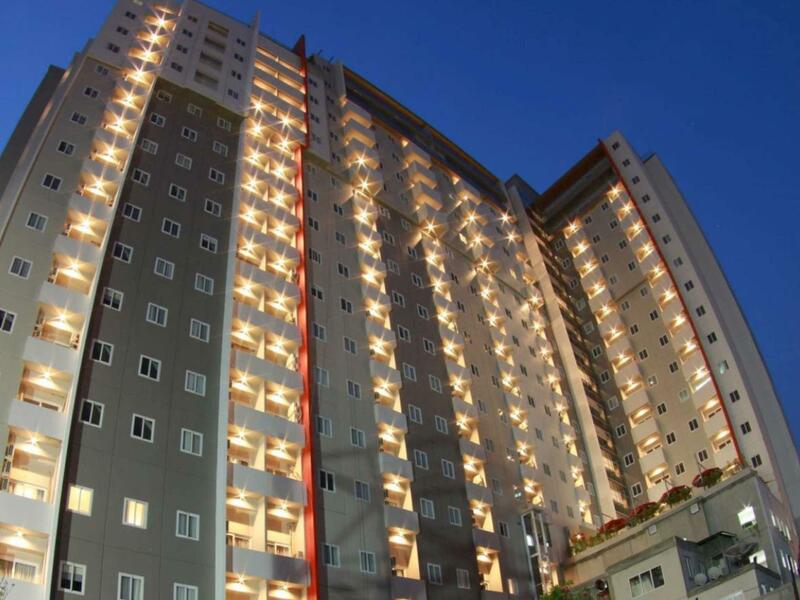 this hotel is located around local housing area. the staff could be more friendly, welcoming and communicative to guests. the room is not so clean but it is OK. It has a living room with a medium fridge. There are two televisions with two AC. Hotel location at city center but access to the hotel has to go through small road. 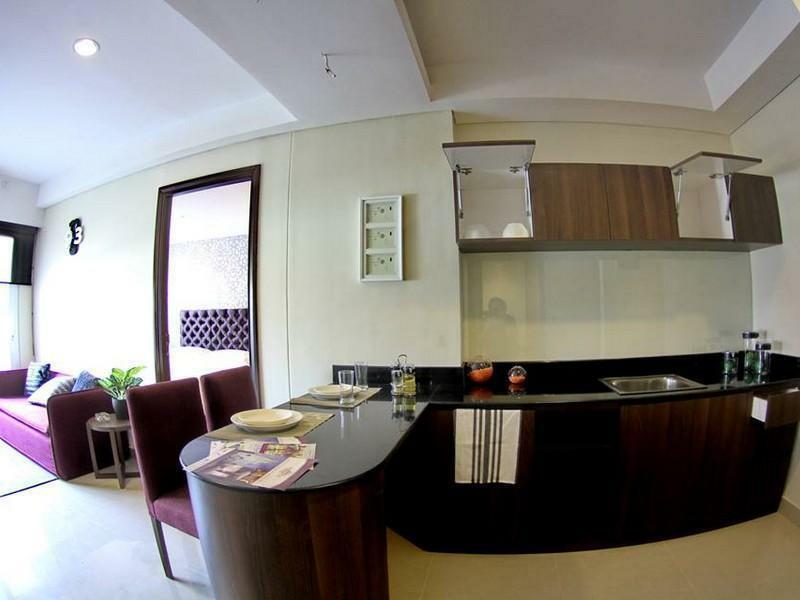 The room like apartment, quite big with separate living room and kitchen set. Very poor internet, poor breakfast choice and limited space. In busy hours, restaurant is full with no space for sitting. And also most of the table are located outdoor. Shower drainage is always blocking, hot water limited. not recommended for business traveller. The very best of this hotel is the room. You'll get an apartment studio size room, with a living room, small kitchen bar, and a large bed. Even the receptionist and service are average, it's good alue for money. I had a nice stay. It was a high season, and the staff was somehow looked not well prepared. Check in process was slow, room was not ready, and the only explanation is "we are in a high season". The room is spacious and comfortable, but I have a problem with the cleanliness. The most annoying thing is they only have one key card for one room, so every time I use the elevator I have to ask someone to press the floor number. Hope it could be better in the future. I enjoyed my stay after all. Good luck MG suites. Very dissapointed with this 4 stars hotel. The services are bad, dirty room, dirty bathroom, staffs are lame. Will never back to this hotel anymore.... they really ruin our new year eve and far from our expectation.. In my opinion, MG Maven is not a 4-star hotel. It is a service apartment. However, it was not really well maintained, room was very smelly with cigarette smoke, not only room, aisle also very smelly, bathroom water flush seems got problem. Lobby very small and the apartment lobby is located in the 6th floor, not very nice, restaurant also very small and very inconvenient to have breakfast. The only good thing is, if you are family budget traveler, I think still ok to stay.